The Ames Test is a way of determining whether a material causes genetic mutations (changes). Animal liver cell extracts are combined with a special form of salmonella bacteria. The mixture is then exposed to the test substance and examined for signs that the bacteria have mutated (a process called mutagenesis). The Ames test does not directly indicate the carcinogenic (cancer-causing) potential of the substance, however there is a good correlation between mutagen strength and carcinogen strength in rodent studies; approximately 75% of chemicals that have a positive Ames test are found to be rodent carcinogens. However, not all carcinogens will give a positive Ames test. Despite these limitations and even though rodent test results do not always extrapolate well to humans, given the relative low cost and low test time (several weeks) compared to traditional animal studies that involve live subjects, the Ames test is an exceedingly useful screening tool for potential mutagens. 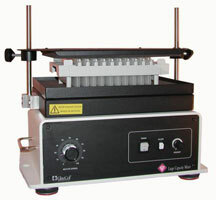 Safety Emporium sells pulsing vortex mixers and other critical lab equipment. Any substance that can mutate the cells of your body is generally a Bad Thing. Avoid the use of mutagens if at all possible. If you must work with them, be sure to utilize the proper personal protective equipment (PPE) recommended on the SDS and use appropriate administrative and engineering controls to protect the other occupants of your workplace. The Salmonella/E. coli Mutagenicity Test or Ames Test at the NTP. The Ames Test at Kimball's Biology Pages. Identification of Food Mutagens at Lawrence Livermore National Laboratory. Test protocol at Nelson Laboratories. See also: carcinogen, mus (mouse), mutagen. Entry last updated: Sunday, July 31, 2016. This page is copyright 2000-2019 by ILPI. Unauthorized duplication or posting on other web sites is expressly prohibited. Send suggestions, comments, and new entry desires (include the URL if applicable) to us by email.